Happy Hump Day! I am so excited to share with you all the next few upcoming blog posts. Since attending the Bloggers workshop almost 2 months ago at Lion & Witch, I have tried to implement new ways on how I do things. If you are a blogger or have been wanting to start blogging, read over what I've learned in my Year 1 of blogging here ! I am so lucky to have found a photographer who is willing to take risks with me and go beyond her comfort zone. Let me tell you, together with Haleigh owner of 120 photography, we are getting much better at our posts with each click! She's wonderful!! If you're a Senior in High School or have a daughter that is graduating as a Senior, please check out her work as Senior Portraits is her specialty. Spring is starting to get warmer here as we push into Summer. However, cooler temperatures in the evening (and early mornings) still linger. I have decided to play around with Lace a little more by slipping it over different bright colored tanks that I have in my closet. This is a simple and chic way to avoid wearing a sweater as those might keep you a little too warm. 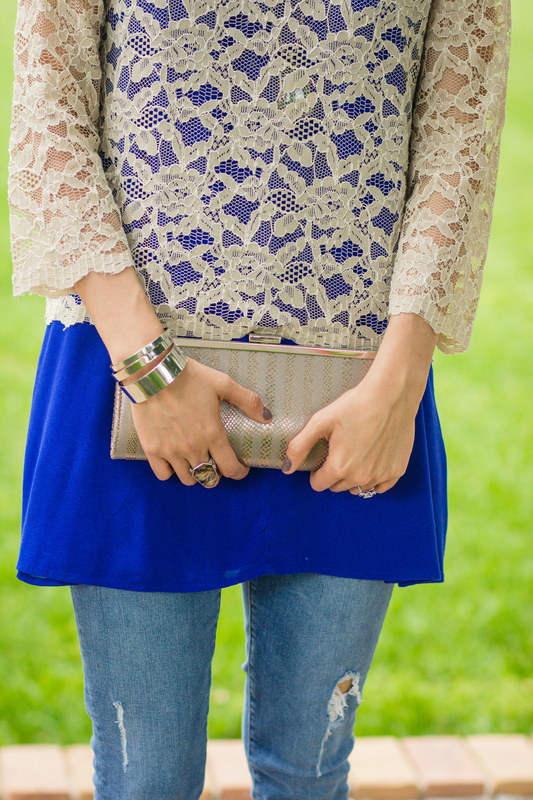 I really like this cobalt blue and lace duo that I have put together. 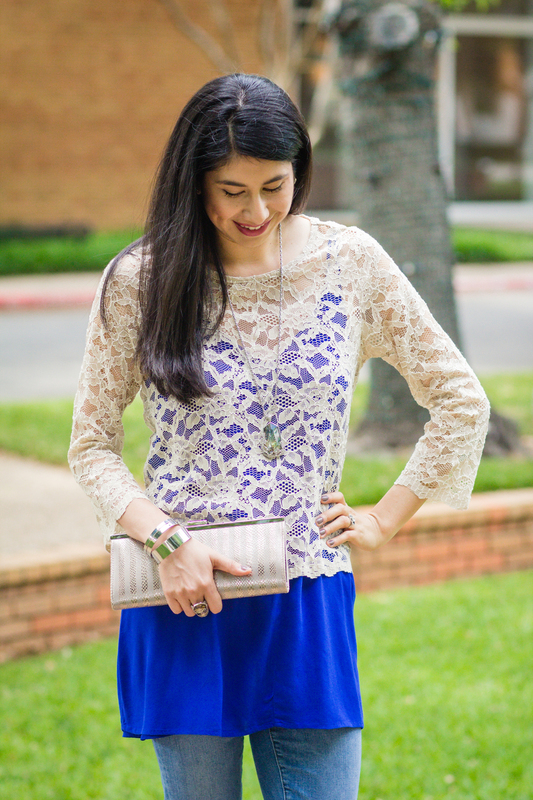 I hope you like it as much as I do and try layering in lace this Spring! It's easy to grab any lace top and bright colored tank to wear, but to achieve this look you want a top that is a bright color and flatters your skin tone! Red and Blue are my colors, and because of this I knew this top would look great with or without the lace top. Try to find a lace top that sits at your hips versus a crop top. It will make your entire look seem more sophisticated than with a crop top. You also want to make sure the sleeves are neither short nor long. This length was perfect! It can fit for both cool and warmer temps. Pair a solid flowy tank with a large, eye-catching pendant. I love this one that is marbled in a variety of colors. The blue tank really brings out the colors on this pendant! Fuschia and Cobalt blue just seem to go together! Here, I tried to color block without these two colors being too close together. I bought these vintage Giani Bini Heels while thrifting years ago and I always receive compliments ! Haven't found any like them anywhere else!